Hollywood Brass combines the talents of Shawn Murphy, Doug Rogers, Nick Phoenix and Thomas Bergersen. Recorded in place at EastWest Studio 1 with 5 user-controllable mic positions, Hollywood Brass is designed to work seamlessly with Hollywood Strings. Hollywood Brass is approximately 150 gigabytes of "pure Hollywood magic" and includes Solo Trumpet, 2 Trumpets, 3 Trumpets, Solo French Horn, 2 French Horns, 6 French Horns, Solo Trombone, 2 Tenor + 1 Bass Trombone, Solo Tuba, Solo Cimbasso, and a low brass section consisting of 2 Tenor Bones, 1 Bass Trombone, 1 Tuba and 1 Cimbasso. A world-class group of brass artists was gathered for a sampling marathon that lasted for 21 straight 11-hour days followed by a year of post-production. True legato intervals at 3 dynamics that are smooth and realistic. Sustained legato samples from pp all the way to fff. 8 way staccato round robin at 4 dynamics. 4 way round robin marcato long at 3 dynamics. Multi dynamic playable runs patches that will inject real life into brass compositions. Multi speed and multi dynamic repetition performances that work with PLAY's time engine. Multi speed time synced crescendos. Various effects and clusters and more. 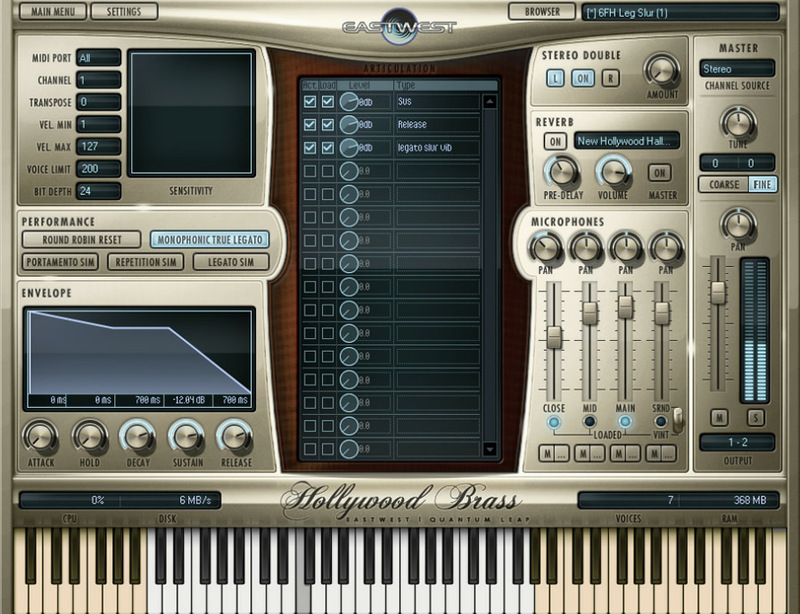 Hollywood Brass also includes new brass reverb impulses taken from the convolution reverb Quantum Leap SPACES. Produced by Doug Rogers, Nick Phoenix, and Thomas Bergersen. Sound engineered by Shawn Murphy - Academy Award, C.A.S. (Cinema Audio Society), BAFTA, and EMMY award-winning sound engineer. Extensive multiple-dynamic "true legato" solo and ensemble brass, with multiple sized sections and mutes. 5 user-mixable mic positions, extensive articulations, and no shortcuts. Includes PLAY 3 64-bit/32-bit software on both MAC and PC, powerful scripting for ease of use, more user control and detail than any other collection, all recorded in the world famous EASTWEST Studio 1, the home of major Hollywood soundtracks and television themes.